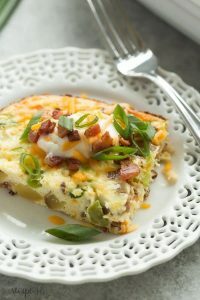 This Loaded Baked Potato Breakfast Casserole has all of your favorites: potatoes, bacon, eggs, sour cream, cheese, peppers and onions! It’s easy to make ahead and is a great healthy breakfast option for the holidays! Breakfast is my love language. Okay so maybe I have many love languages. Breakfast foods. Coffee. Chocolate. Pasta. Cookies. But breakfast is that one that I don’t feel guilty indulging in regularly. 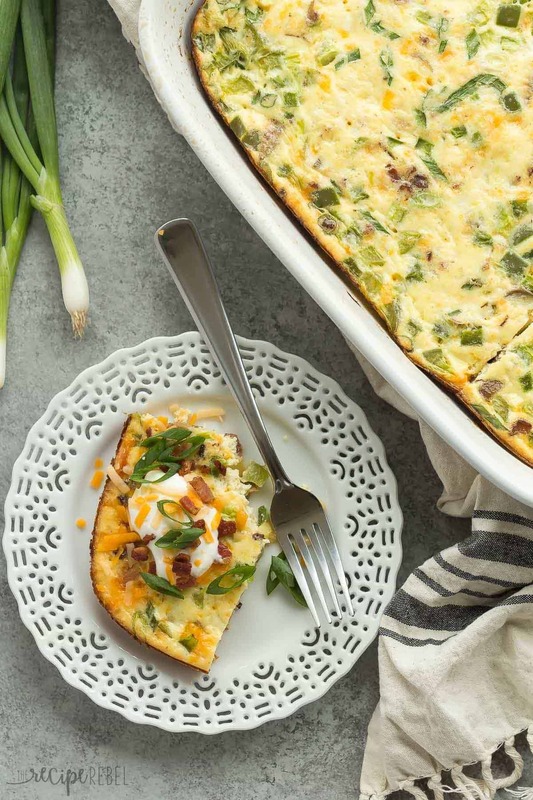 As much as I love a Nutella-filled crepe, waffles or pancakes loaded with whipped cream and berries, or a French toast casserole (<– what I like to call Breakfast Dessert), I also love how easy it is to pack a pile of protein and veggies into just about any breakfast casserole, omelette, sandwich, or wrap. I know that loaded baked potatoes sound totally rich — an over-the-top comfort food. But this casserole is packed with all kinds of good things — eggs and bacon for protein, Creamer potatoes (I used Blushing Belles from The Little Potato Company) and peppers for your veggies — and just a bit of sour cream is whisked into the egg mixture to give it that familiar tang and a punch of flavor. And a little bit of cheese, because, well — cheese. I’m going to be completely honest here — I dislike sour cream by itself. But added to baked goods, cheesecakes or a casserole like this? A little goes a long way and adds this creaminess that you just don’t get from milk. I always use light sour cream to keep the fat content down. 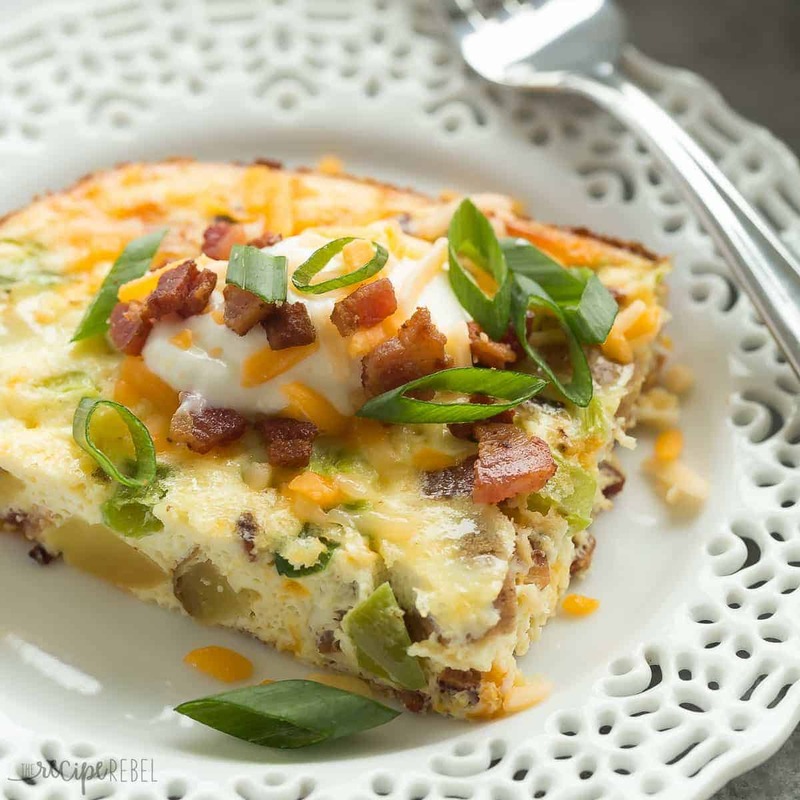 This Breakfast Casserole is the perfect make ahead brunch dish for the holidays! You can easily prep ahead of time, and bake just before serving, or bake it completely and simply reheat when it’s time. Egg dishes reheat beautifully, which takes so much of the pressure off on The Big Day. They’re also perfect for reheating on those crazy weekday mornings, (<– not that I know anything about trying to get a 2 and 4 year old fed while sufficiently caffeinating myself), or for breakfast for dinner with the leftovers making a solid breakfast the day after. Because this casserole doesn’t have any bread, it’s easily made gluten-free, just be sure to double check all of your ingredients and open fresh packages to avoid cross contamination. You can also swap out the bacon (though there isn’t that much in there!) for turkey bacon, ham, sausage or turkey sausage if you prefer. *This recipe was created in partnership with The Little Potato Company as part of my ambassadorship with them and I was compensated for my time. I’m so grateful to them for allowing me to bring you these recipes! 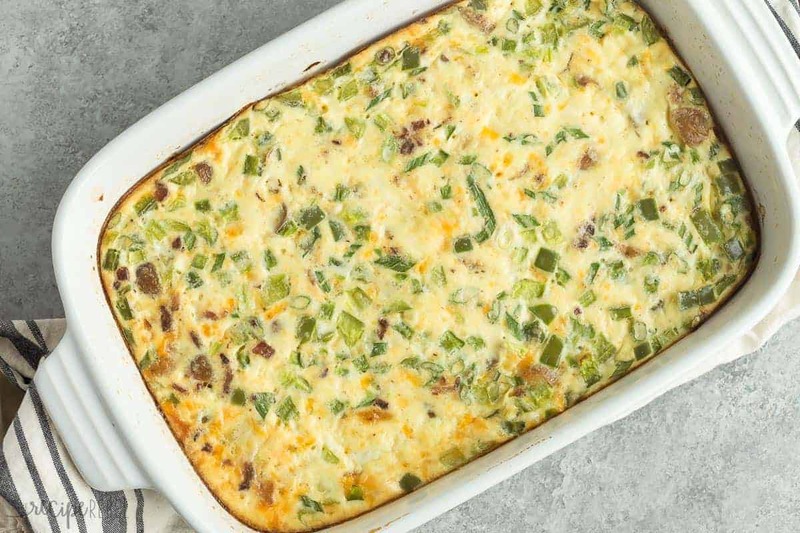 This Loaded Baked Potato Breakfast Casserole has all of your favorites: potatoes, bacon, eggs, sour cream, cheese, peppers and onions! It's easy to make ahead and is a great healthy breakfast option for the holidays! Preheat oven to 400 degrees F and line a baking sheet with foil. Bake potatoes for 30 minutes or until tender. Cool completely and chop. (To save time, cook potatoes in the microwave for 5-8 minutes, checking every 3-4 minutes). Reduce oven heat to 350 degrees F and lightly grease a 9x13" casserole dish. Stir in cheese, pepper, onions, bacon and potatoes until combined. Pour into prepared casserole dish and bake for 35-40 minutes, until center is set. If edges are browning too quickly, cover with a piece of tin foil and continue baking. *Nutrition information is estimated and will depend on exact serving size, brands and products used. Reduce oven heat to 350 degrees F and lightly grease a 9×13″ casserole dish. Has anyone tried assembling the night before and baking in the morning? I assume I can substitute ham cubes for the bacon? That is so helpful Gwen! Thanks for sharing! I don’t recognize the potatoe brand so I’m wondering if they are Idaho potatoes, frozen potatoes or ? Thanks! They are Creamer potatoes and should be readily available in the U.S. and Canada. https://www.littlepotatoes.com/ You can use the same weight in a variety of potatoes for the recipe. Just wondering if it would be ok to make it the night before and bake it in the morning? Is that too far ahead? I haven’t tried it but I think that would work great! This is like quiche with potatoes!! It could easily be made with frozen hash browns~ they’re in my freezer!! And it would be great for supper, too. I like breakfast for supper and supper stuff in the morning. I love sweet breakfasts, but I’ve been walking on the savory side a lot more and I love it! This is so perfect to have during the week and I love everything you loaded into it! Yes, breakfast is definitely my love language and anything that I can make ahead of time is always a winner around here! This casserole looks SO good, Ashley! I’d love a big plate for breakfast, lunch or dinner! LOL! I have a bunch of food love languages too, and breakfast is TOTALLY one of them! 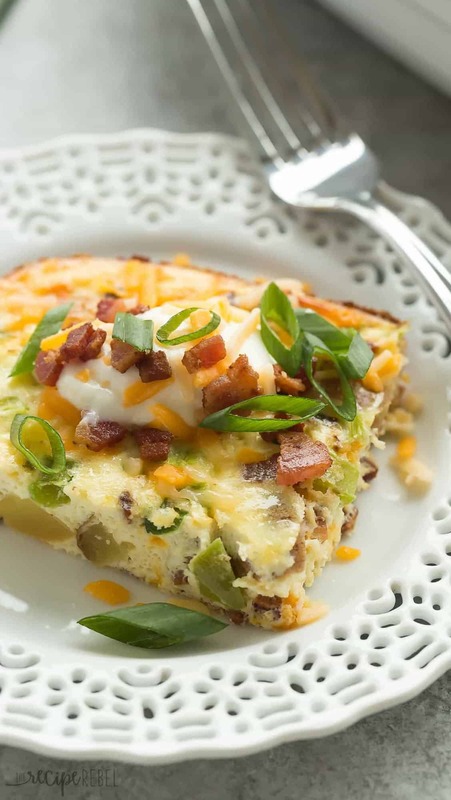 This b-fast casserole is like WHOA girlfriend! You weren’t joking around when you named this “Loaded”! Seriously, I am DROOLING! I could eat this bad boy for breakfast, lunch AND dinner! On REPEAT! Cheers! When breakfast looks like this it’s my love language too! YUM! Hi Ashley! This would be perfect for dinner on the ever increasing cold evenings. A nice hearty casserole is always welcome here! Here too, especially a breakfast casserole! Thanks Dorothy! This looks so incredibly delicious, Ashley! Loving all the textures and flavors in here, and this would be so perfect for a holiday morning meal. Yum! Breakfast is my love language too, especially when it’s for dinner! I love making casseroles like this because it’s so easy to throw together and makes great leftovers, too. This baked potato version is calling my name! I love how simple, yet flavorful this is. Definitely what I need for breakfast (or dinner) this week! Yes, I love the leftovers too! I always make an extra big one so I have something in the fridge for those days I don’t feel like cooking!